On Day 3 we travelled to the Cocoa Research Institute of Ghana (CRIG) at New Tafo in the Eastern Region as the guest of Dr Isaac Opoku, head of the Plant Pathology Department. 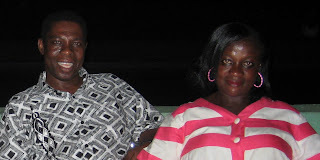 His wife, Gertrude, is a former teacher and the proprietor of a private school in New Tafo. 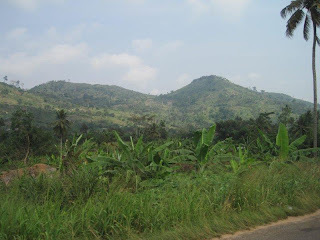 The scenery was very different to that seen so far in Ghana as the region has many hills. 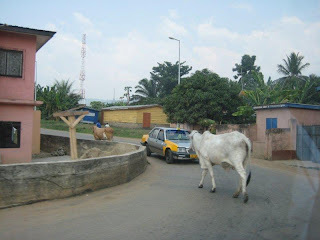 But there were still many things on the road to slow us down. 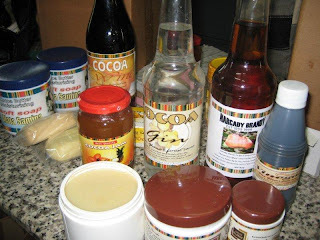 Cocoa is Ghana’s largest export and is vitally important to the country’s economy. 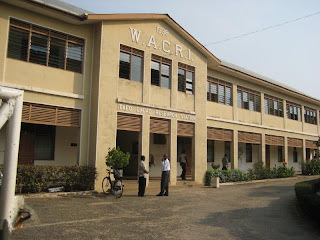 The Cocoa Research Institute of Ghana (www.crig.org ) was founded by the British in 1938 during its colonial rule of the Gold Coast as Ghana was called before it gained independence from the British in 1957. CRIG’s role is to research into all aspects of cocoa production and its possible uses. As a result of the usual heavy traffic in Accra and the extensive road works, it took nearly all day to travel to CRIG in New Tafo. 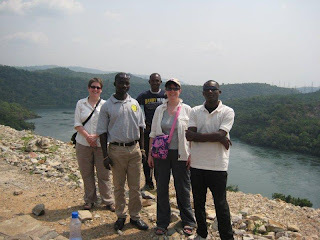 Our visit to CRIG was typical of the generosity and hospitality of all the Ghanaians we have met. Dr Isaac had arranged for us to visit a number of places of interest during our very busy three day visit. 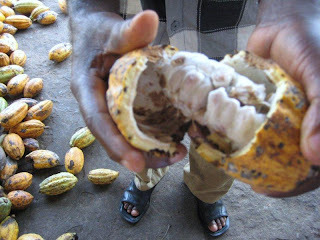 At the Cocoa Research Institute we found out about the organisation’s work and learnt about how cocoa is processed. 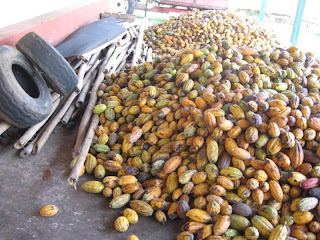 Stage 1 – Farmers harvest cocoa pods from the trees when they are ripe. Stage 2 – The beans are removed from the pods. Nothing is wasted, as the pods are used for animal feed or composted to produce fertiliser. 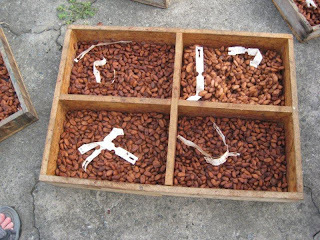 Stage 3 – Four varieties of cocoa are grown in Ghana. Stage 4 – Before they are dried, the cocoa beans are white on the outside and purple inside and have the familiar cocoa smell. 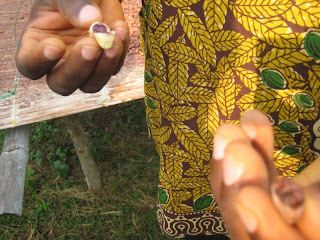 Stage 5 – The beans are left in the open to dry and gradually change to a chocolaty brown. Workers remove any bad beans and use these for animal feed. 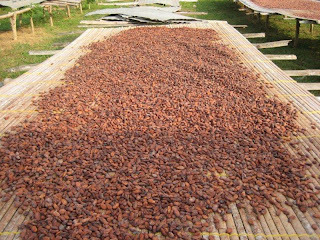 Stage 6 – As well as using cocoa beans for chocolate, CRIG has developed numerous other products that can be made from the beans. Many of these products are at the prototype stage, but some well known companies have expressed an interest in them commercially. CRIG are also researching into other uses for cashew nuts, coffee beans and shea nuts. 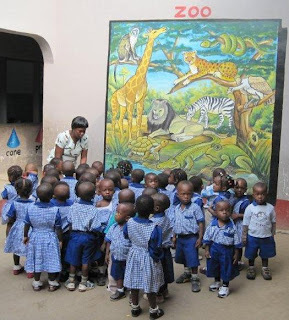 After our visit to the Cocoa Research Institute, we visited Madam Gertrude’s school the Royal Ascot Montessori School. It is named after Royal Ascot because that is where Dr Isaac lived whilst studying for his PhD at Imperial College, London. 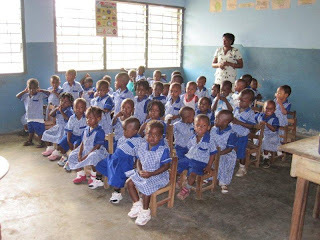 The school takes children from as young as two and the oldest students are about 14 years old. 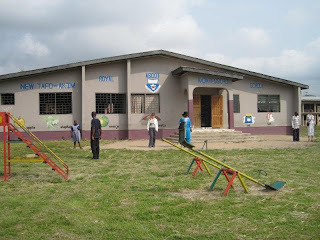 The children were well behaved, but when the older students were given an opportunity to interact with us they found it difficult and could not think of any questions to ask. No the picture below is not a mistake! 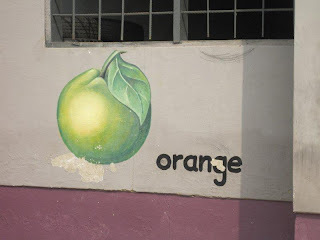 In Ghana the variety of oranges grown are green and only turns orange when they are over ripe. 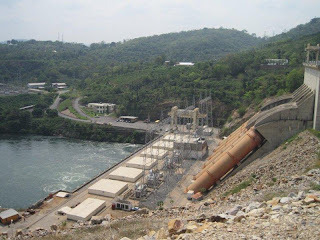 The Akosombo Dam is an amazing structure and produces enough hydroelectric power to meet 65% of Ghana’s electricity needs. 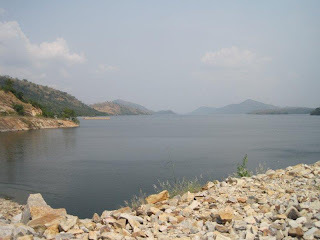 When it was completed in 1965 it created the largest manmade lake in the world – Lake Volta. 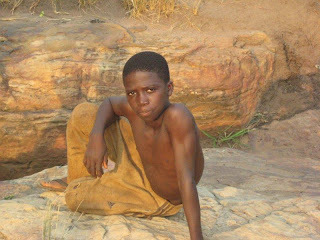 Many villagers had to be relocated as a result and some controversy surrounds the way in which the people in the villages were treated. 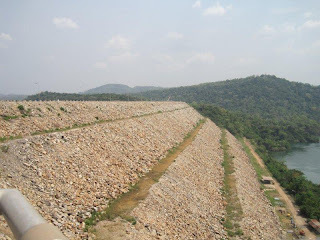 Changes to the country’s rainfall pattern and the construction of dams in neighbouring countries, especially Burkina Faso, has had some impact on power generation. 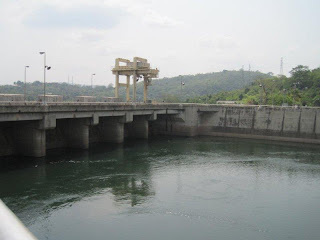 However, Ghana has reached an agreement with its neighbours to secure the flow of water to the lake in return for supplying these countries with a quota of free electricity. The day we visited the dam was so hot even the vultures were having to take it easy! 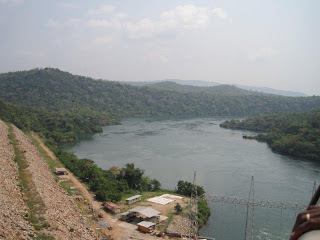 On the way back from the Akosombo Dam we visited a tourist attraction that included a waterfall – except there was no water as this is the dry season! 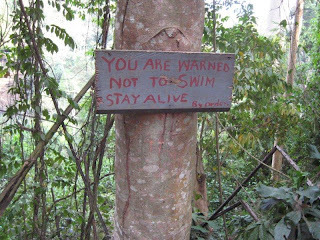 However, the management did offer some helpful advice. 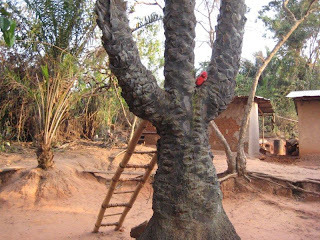 A very rare palm tree that has three branches –most only have a single trunk. 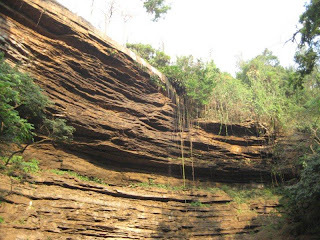 And an umbrella rock that was apparently arranged in this way by God. 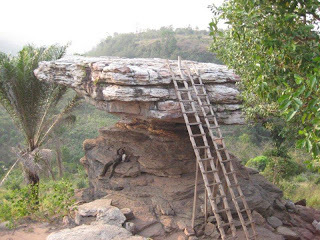 The ladders belongs to the man lying on the rock - he very enterprisingly charges people to use it. 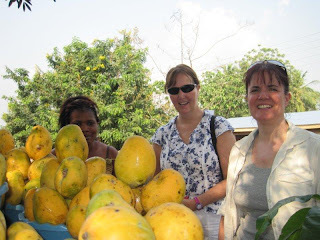 On the way back to our accommodation on the CRIG site we stopped for some delicious mangos. Our host did the negotiations for us and we asked him for three large ones and three small. We han't realised that the mangos were sold by the bowl until the trader started filling the carrier bags - it was fortunate that we all liked mangos as we certainly had plenty for the next few days!